The colour yellow, whether pale lemon or brilliant gold, adds sparkle to the summer garden. Yellow is the colour of joy. It is associated with laughter, happiness and good times. A person surrounded by yellow feels optimistic because the brain actually releases more serotonin - the fell-good chemical in the brain. Yellow blooms are happy, cheerful flowers for your garden and walking into a garden with yellow blooms is like walking into the sunshine. 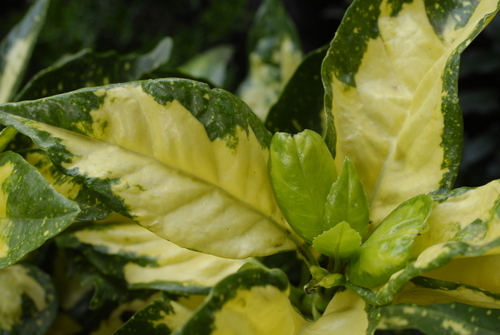 How to you bring sunshine yellow into your garden? 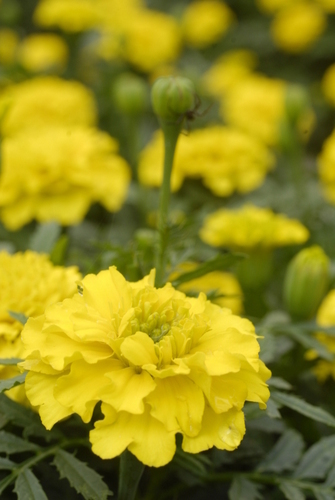 For instant yellow, plant up a border of yellow marigolds. These cheerful annuals have the added advantage of being able to tolerate heat – an essential aspect in plant choice for gardeners in sunny South Africa. They are also an extremely valuable companion plant in both the flower and the vegetable garden as they exude chemicals from their roots and foliage that suppress or repel pests, thereby protecting neighbouring plants. Marigolds come in sunshine colours of cream, lemon, butter-yellow and burnished gold. 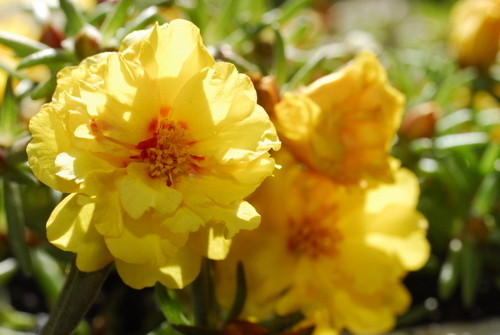 Use dwarf marigolds for edging paths and borders, for rockery pockets, in containers as well as the veggie patch. Day lilies are always rewarding in the summer garden whether grown in a mixed border or on their own in large groups. They are appreciated for their ease of culture and include lemon, yellow and gold shades. Another favourite, alstroemerias, come in tints and tones of yellow. 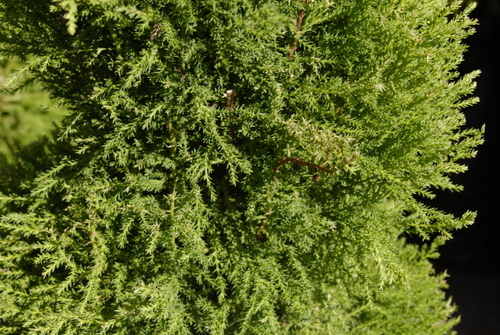 Their growing requirements are sun or semi-shade and fertile, well-drained soil. Tall growing varieties will require some form of staking. Yellow rudbeckias are easy-to-grow, water smart perennials (60-90cm tall) guaranteed to brighten any border or meadow-style garden. Rudbeckia hirta ‘Toto’ is a lower growing dwarf variety. In terms of garden design, yellow combines beautifully with many colours. Pale lemon yellow blooms are ideal for a border in pastel shades, while flowers in deep golden shades are essential in the richly hued ‘sunset’ border of reds, oranges and yellows which are currently the height of fashion in British borders. The renowned Victorian garden designer and colourist Gertrude Jekyll combined lemon flowers with deeper blues, and cooled down bright yellow with silver-grey. Landscapers have been successfully using this superb colour combination for well over a century, so for a flawless colour combination in your garden use this time-tested grouping. Examples are lemon petunias with blue salvia, or yellow day lilies with blue agapanthus. 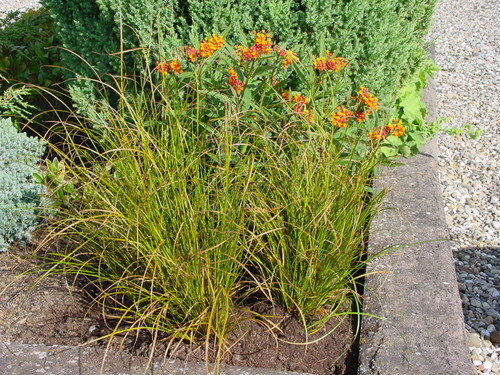 In an indigenous low water usage garden, grow yellow bulbine and yellow gazania with bluefelicia. Try lemon yellow marigolds, alstroemaria and roses with blue salvia, purple verbena and tulbaghia for a cottage garden effect. You can add touches of grey foliage such as lamb’s ear or artemesia. This colour scheme is also ideal for a garden with a Provençal theme – plant yellow daisies (Argyranthemum cvs. ), gazanias and arctotis with mauve and purple lavender, nepeta, tulbaghia, and statice together with grey-foliaged plants. On the other hand, for a lush tropical look, select large-bloomed plants in these shades such as yellow hibiscus and cannas, combined with purple bougainvillaea and Tibouchina 'Jules'. This is a sophisticated and harmonious combination. 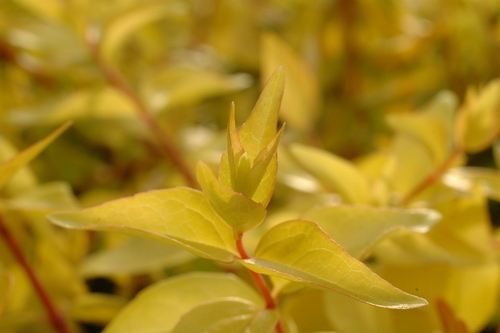 Try, for example, deep yellow roses with Coprosma repens ‘Marble Chips’. This striking combination is very trendy in dry gardens in the USA. 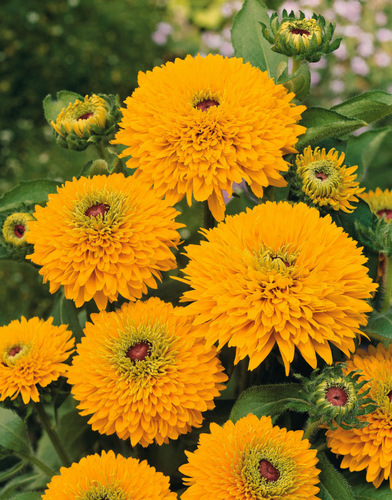 Try yellow coreopsis and pink echinacea, or magenta portulacas with yellow gazanias and zinnias. Annuals: Snapdragons, marigold, portulaca, zinnia, yellow petunias. Perennials: Alstroemaria, canna, day lilies, wild iris (Dietes bicolour), gazania. Shrubs: Roses, Chinese lantern (Abutilon 'Lemon Queen'), yellow marguerite daisy (Argyranthemum cvr. ), yellow Cape honeysuckle (Tecoma capensis ‘Lutea’), hibiscus. Ground covers: Arctotis, dymondia, gazania, Lysimachia procumbens ‘Sunburst’, othonna. Climbers: Roses, bougainvillea, Allemanda cathartica, canary creeper (Senecio tamoides), yellow black-eyed Susan (Thunbergia alata).